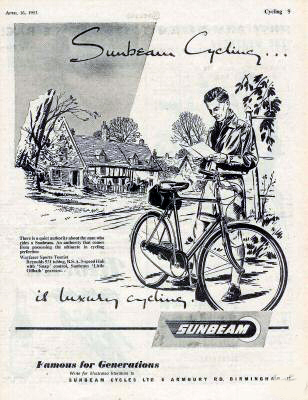 Sunbeam is well known as the Rolls Royce of the bicycle world. This particular example is the bicycle equivalent of finding an old roller locked away in a garage after 30 years …a time-warp. It’s in extraordinary original condition. Why does an unrestored vintage vehicle in such amazing condition sets our pulses racing? An old bicycle has grace, beauty and character. Maybe it’s the idea of cheating old father time that appeals to us? Perhaps it gives us hope? I do love pedals with names in them. 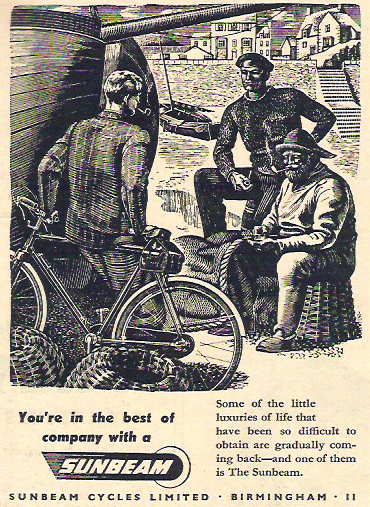 On this bike, you motivate yourself by stepping on a sunbeam. The weatherproof mudguards make it a safer puddle-splasher. A previous owner fitted the Sturmey Archer gear change to the left rather than the right. I have a green Ladies model to match this Gents. You can see it on the next page.